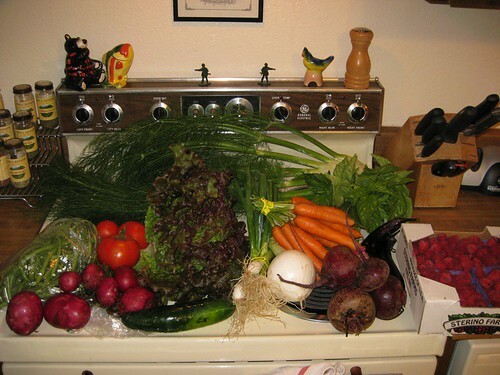 CSA, Week 10 - Crochet, Starbucks and roadtrips, oh my! So pretty. The eggplant are banana-shaped. I'm not sure what to do with them that will ensure that Cory tries them. He doesn't like them. He also doesn't like beets, which is too bad. I wonder if I can "can" them without a jar. Can one Tupperware a beet? Hmm. Also, if you have any fennel recipes that are delish and also downplay the licorice flavor, let me know. Cory doesn't like licorice and therefore doesn't like fennel, unless it's hiding somewhere. Last time I cooked with some I made a veggie stew. Maybe I'll have to do that again this time. 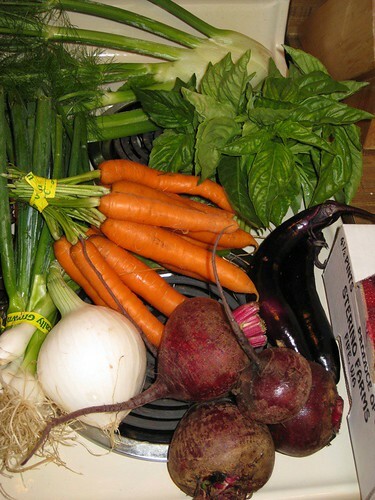 want my borscht recipe? it's foolproof...first time I made it it was DEEElicious! Yeah, that'd be great! Foolproof is a good quality. oh crap. I can't find it!!! I will have to call my mom and get it again, cause it was a good recipe....what the hell! It's totally disappeared!